It Was A Complete Overhaul – Something That I Needed Badly. I wasn’t always into fitness. In fact, the only sport I did was dressage, which is sort-of like dancing – but on horses. It probably was more of a sport for the horse than me, but hey, I get to dress up – and ladies, we know that’s the whole point of everything ? In uni, I studied mining engineering, and there were only 3 other girls in the course. Let’s just say that there’re no cool kids in mining engineering. After graduating, I worked in the mines in Western Australia. 13 hour shifts at 52 degrees – not fun. Not fun at all. My job was fit – probably harder than gym training, if you considered the heat stress, exhaustion, dehydration… But some things, you just had to do, and from there, I worked my way up to an office job in Melbourne (thank goodness!). Sadly, with an office job and the great food in Melbourne, I started to gain weight. At the same time, I was preparing for my wedding and I wanted to look great for my big day. So I went to a couple of different gyms and had some PT sessions throughout the years. None of them were really structured. I could go in one day and my trainer would ask me, “So what would you like to do today?” Isn’t that the whole point of personal training – to have someone structure your program and tell you what you needed to do? Of course I didn’t see results ?If anything, I was getting bigger when I was trying so hard to lose weight! Every where I went, I was told something different – have this much protein, eat more to boost your metabolism… I even had a personal trainer tell me that I’d never lose the weight, and I’d have to wear a corset on my wedding day! I was getting so confused. All I knew was that if I didn’t eat I would be able to lose weight. I lost 16-17kg in 5-6 weeks and looked fantastic for my wedding. BUT – I was hungry, cranky, and my nails were starting to break. As soon as I went on my honeymoon, I gained back all the weight, and more! When I came back, I didn’t want to starve again. I’d had enough of untailored PT sessions that did nothing but confuse you. That’s when I stumbled upon the Enterprise Fitness website and was blown away by all the bodybuilding photos. At that time, I was really insecure about the weight I’d just gained, and thought, “who the hell am I? This isn’t for me.” I just couldn’t bring myself to come here. But I kept coming back to their website, and eventually worked up the courage to dial their enquiry line. The day that I walked through the doors, I had a long meeting with Tania, and signed up immediately. You don’t just get any trainer at Enterprise. They spend time to get to know you as a person – your personality, goals and history, before pairing you up with a suitable trainer. I got paired up with Liam, and everything just ‘clicked’. But regardless of who you get paired with, everyone here’s serious about making you do the movements right and training hard, but at the same time, they have such great personalities that no training session is ever boring. It’s like having a friend who’s sometimes mean to you – but that’s okay because that’s exactly what you want them to do! 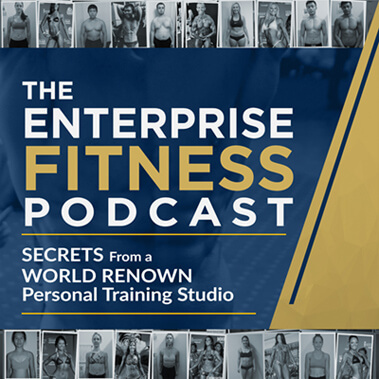 Enterprise has changed the entire way that I look at food, my lifestyle and eating habits. It’s not just about measuring my food, but also about learning what foods work (or don’t) with my body – which is something I’ve never been able to achieve with irregular eating habits. And every week, they assesses my progress and makes tweaks to my nutrition. My goals have changed over time. When I first came in, I was just focused on losing weight. Now, I want to get stronger, and live a healthier lifestyle. In fact, I was away for my one-year wedding anniversary recently, and was able to have a reefed meal without feeling guilty. Of course I still kept active with some running, swimming… cause that’s who I am now – a healthy, active person! Unfortunately, I can’t stay here as I’ll be going back to Queensland to develop a horse breeding property, which is something I’ve always wanted to do. But I’ll be coming backwards and forwards, and I’m definitely looking at online training with Enterprise Fitness because I just LOVE it here! My friends already think I’m crazy for waking up at 5am and then travelling 1.5 hours from Brighton to get to Richmond and back again – just for my 7am training sessions! Sometimes my trainer Liam brings me coffee, so that makes it even better ? ?